Simmons, a first-generation college student who returned to school to earn his bachelor’s degree in English Education from Fresno State in 2016, just started his first year as a full-time English teacher at Kingsburg High School this fall. Even though he found English and other classes in the arts and humanities interesting, Simmons says the timing wasn’t yet right for him to be successful in college. He failed to find the motivation to show up. He got poor and incomplete grades. So he left to pursue a job, “to really sink my teeth into something and to learn what that feels like to commit to something,” he says. So, you ask: What did you do for work? He did. Coming back to Fresno State in the fall of 2015, he was a long shot to earn a spot in the English teaching credential program. Two and a half years later, he finished it. 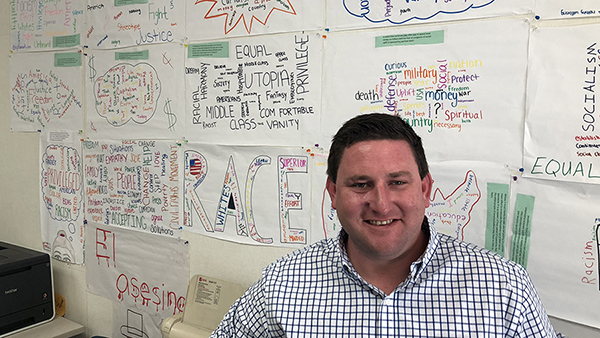 Simmons credits the classroom style of English professors Dr. Samina Najmi, Dr. Kathleen Godfrey, and Dr. Laurel Hendrix with helping him craft his thinking about what being a successful teacher might look like. Visit the College of Arts and Humanities blog to read more.